Plans for a 65,000 square foot business hub in Haywards Heath which will make the town an ‘extremely attractive location for major companies’ have taken a step forward. The Commercial Park Group, a partnership between developer John Baker and leading building and civil engineering contractor Sir Robert McAlpine Ltd, has submitted its first planning application for the hub – Haywards Park. It is the first phase of a wider project to create business hubs across the south east. If it goes ahead, offices in Perrymount Road will be redeveloped for the hub. John Baker of The Commercial Park Group, said: “We’re excited to have submitted our first planning application for Haywards Park which we think will provide the town with the kind of high quality offices it needs to attract major companies. “We’ve put a lot of work into the scheme to make sure that it’s really beneficial to the local area so very much look forward to a decision from the local authority in due course. The Commercial park Group has got planning permission for its Gatwick Park business hub in Crawley and it is undertaking pre-planning works for a hub in Bromley. All together, two million square foot of new office space, with a total end value of around £2bn is being proposed, a spokesman said. They added: “The decision to develop new office schemes in strategic locations like Bromley, Haywards Heath and Crawley is underpinned by shifting working trends and dynamics in the UK office market. “Many workers are increasingly looking for a more flexible lifestyle outside of London. 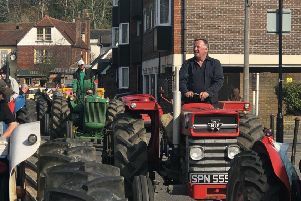 “This has led to the build up of a large, skilled workforce across the south east in places like Haywards Heath and many of these workers would value the wellbeing benefits of being able to work closer to home.